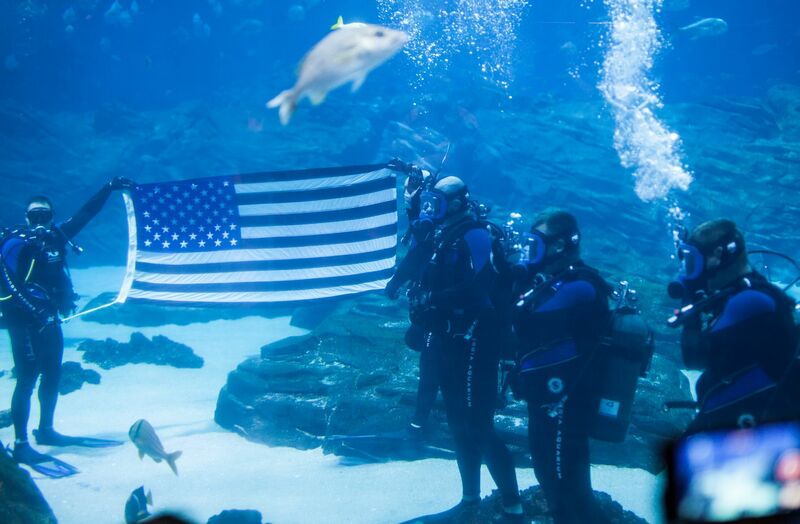 Georgia Aquarium will commemorate Veterans Day as part of its Military Salute program on Saturday, Nov. 11. All active military personnel and veterans will receive free admission to Georgia Aquarium all day on Saturday. Family members will receive 30 percent off general admission (see the aquarium's Military Mondays webpage below for details, terms and conditions). At noon, the aquarium will host a presentation by the Kennesaw Mountain High School NJROTC Color Guard. Free admission is offered for all active, retired, and reserve military personnel today. Military family members receive $2 off the cost of general admission tickets (+ tax). Be sure to show your military ID in the Welcome Center when you purchase your tickets. Honor and salute veterans during a special music and movement program, storytime, an art studio and more. The Center for Civil and Human Rights is honoring our veterans with free admission on November 11, 2017 with valid Military ID or Form DD214. Family members of veterans will receive 50% off their general admission ticket. This promotion is only available for use on November 11, 2017 with valid ID. World of Coca-Cola is pleased to offer an additional special in honor of Veterans Day. Now through November 12, active duty, reserve and retired members of the U.S. Armed Forces may purchase up to four World of Coca‑Cola general admission tickets at 50% off for their friends and family. Tickets may be purchased at the attraction’s ticketing windows when members present their valid U.S. Armed Forces ID. Active and retired military members are granted free admission to the Hall with valid ID. Tickets are only available through the Box Office onsite. This weekend, enjoy Tailgate Saturday Built by the Home Depot, in addition to the temporary Attic Treasures exhibit. Military (active or retired with ID) receive complimentary admission to the Behind-the-Scenes Tour and their families receive special pricing at $12 plus tax per person. Please call 1-877-4CNNTOUR for more information or to make a reservation.